The central nervous system of vertebrates is composed of encephalon (generally referred as brain) and spinal cord. 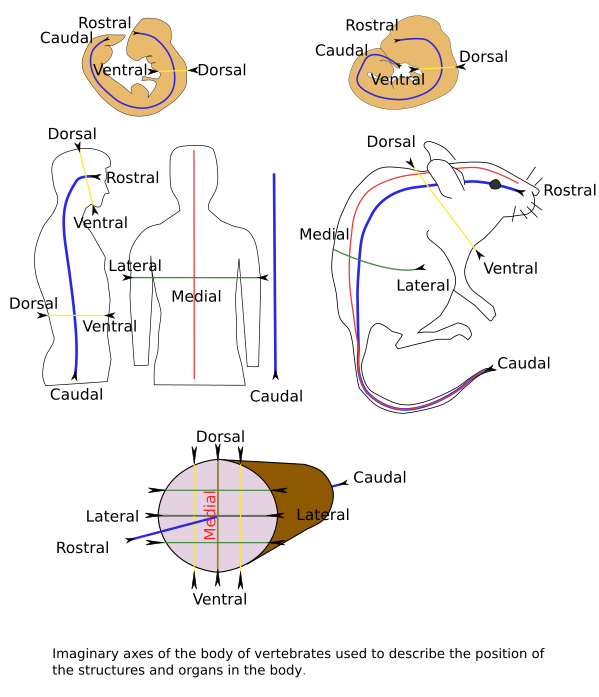 During embryonic development, both derive from a group of cells known as neural plate, located at the medial and dorsal part of the embryo (see figure for the names of body axis). The neural plate extends rostro-caudally. The lateral margins of the neural plate move upward forming long folds, whereas the middle part moves inward forming a long invagination. 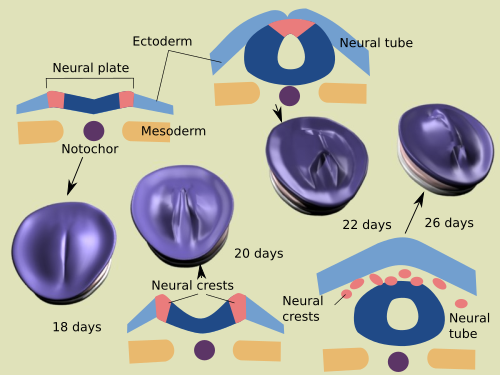 As development proceeds, lateral folds, known as neural crests, get higher and closer until they contact and fuse between each other, so that a long tube is formed inside the embryo. This tube is known as neural tube and the process as primary neurulation. At the most caudal part of the embryo, however, the neural tube is formed from mesenchymal tissue by the so-called secondary neurulation. Primary neurulation in a human embryo. The encephalon appears in the most rostral part of the neural tube. 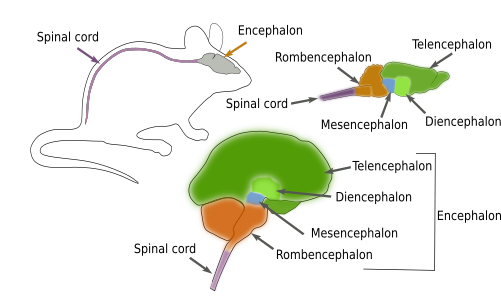 During the early stages of development is divided in three compartments (from rostral to caudal): prosencephalon, mesencephalon and rhombencephalon. 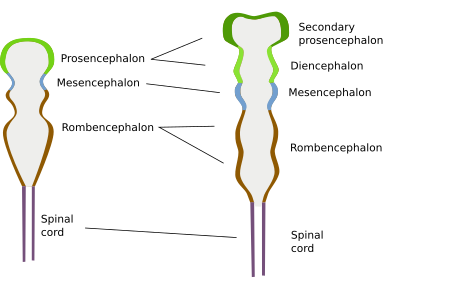 The caudal part of rhombecephalon continues with the spinal cord, which extends until the caudal part of the embryo. Later in development, the prosencephalon is divided in two new compartments: secondary prosencephalon and diencephalon. The telencephalon is a part of the secondary prosencephalon. The rhombencephalon has been traditionally divided into metencephalon and milenecephalon, but now is divided in rhombomeres, which are transversal segments of the rhombencephalon. These compartments are found in the central nervous system of all vertebrate animals. Major compartments of the central nervous system during embryonic development. The encephalon and spinal cord derive from the hollow neural tube. So, they have internal cavities, which are connected between each other. These cavities are filled with the cerebrospinal liquid. The largest cavities are known as ventricles, found in the encephalon, whereas a long duct, known as central canal or ependimary canal, runs along the spinal cord. The encephalon is caged by the bones of the skull, whereas the spinal cord is protected by the vertebral column. Meninges are thin layers of tissue located between bones and nervous tissue. We are going to see in the next pages the different compartments described above. We have to keep in mind that these are anatomic compartments. However, from a physiological point of view, they form an integrated structure that works highly connected. Main compartments of the encephalon of a rat (up) and a human (bootom). Note that they are not in same scale.